If for sale, how much for the two-price web Worth Ranger? I'm curious about the quality of the Worth Ranger? Hows the leather? How does it play? what is that wing tip rawlings? They are exactly like a HoH but with a thicker padding. Mine has a 200 pattern, I took some pictures with my HoH and they are almost identical. Love the Rangers. 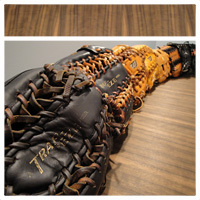 Highly underrated, best worth baseball glove ever made, and too many people passed em up and now they are discountinued.